Never thought watching one woman ride round a track for an hour would be this engaging! spectator sport. How exciting could it be? Of course, the success of Team GB at 2012 introduced cycling to a whole new audience and I was one of them. I was lucky enough to see the Olympic BMX finals, but it was the track that really got me hooked. During the BMX events spectators were allowed to use the bathrooms in the velodrome next door and this was the first time I’d actually seen a track in real life. It wasn’t the wall-of-death steep banking or the scale of the place that grabbed me. Walking in just days from so many Team GB golds it was the atmosphere and the memories of what I’d been following at every opportunity on the television (or sneaking glimpses at my desk). It was breathtaking and inspiring. 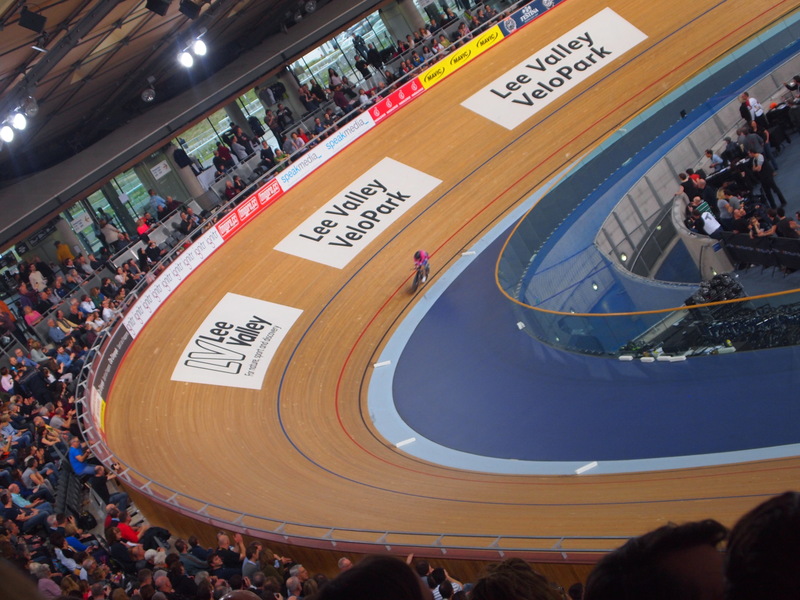 The re-opening of the Lee Valley Velodrome in March 2013 means I am now only a short train-ride away from world-class events. 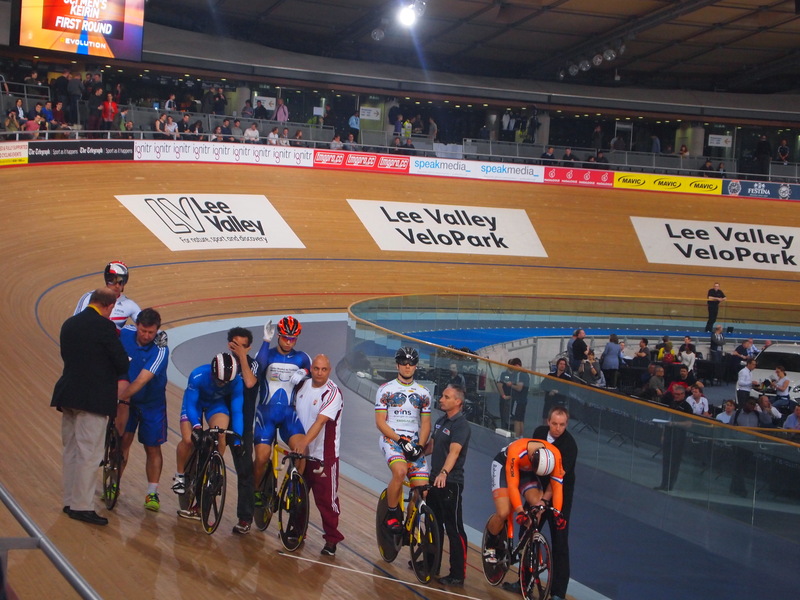 A regular event at the velodrome is the Revolution Series which features an elite championship for the men over the course of the series, sprint and endurance events for men and women and a ‘Hoy’s Future Stars’ competition for the junior hopefuls. There’s UCI Points up for grabs to add to the drama. The series takes place over 6 events hosted in Manchester, Glasgow and London. The Revolution attracts some pretty big names – Ed Clancy, Peter Kennaugh and Jack Bobridge to name a few although the girls have put on the most engaging performance lately. At stage one back in October I witnessed some incredible racing between two personal cycling heroines, Marianne Vos and Laura Trott. The most recent event was extra-extraordinary thanks to the awe-inspiring attempt at the hour record by Dame Sarah Storey. OK she didn’t quite get the overall record but she still came away with the Masters (senior) and UK records and I think we could all feel it when she finally got the opportunity to sit in a comfy chair and instead slumped lifeless to the ground. I haven’t witnessed such an electrifyingly enthusiastic crowd since I was at the Olympic Taekwondo when Jade Jones took gold. Of course, I don’t go to the velodrome for the booze. Being a sports venue it’s got to please everyone but at least has a local pale and IPA from Meantime at £5 for a pint. Not badly priced in a venue but not a particularly flavorsome offering. I always look back to the first Revolution hosted there with fond memories, back when the beer was provided by Look Mum No Hands. Thankfully we’d made a stop at Bottle Dog for a few sneaky walking beers, one of which was Snakecharmer from local brewers One Mile End who, unlike Meantime, don’t seem to be afraid of chucking a few hops in. At a modest 5.7% ABV this was a flavor-packed juicy sweety with ultra fruity hops. Of course, if you didn’t plan ahead there’s always the Tap East, resident craft beer haven in the soulless temple of consumerism that is Westfield. On the 6 cask and 10 keg taps you’re likely to find a number of dull crowd-pleasers for the broken-down shopper to toss down their parched gullet in an attempt to forget the apocalypse is happening around them. However you’re also likely to find at least one or two little gems. On the day we were there the best thing on the bar was Drink Me – Pimiento & Rosemary from the Scouser Mad Hatter Brewing Company which was an incredibly well-executed wit enriched with aromatic rosemary. It made me want a Sunday roast to eat with it even though I don’t really even do roasts. Yummy! We definitely saved the best till last and the beer of the weekend was on the way back to the train at The Craft. Having missed the Wild Beer tap takeover the previous night, we headed in and to our delight there was still plenty left including the beer I was most excited about. As the girl who can clear a chip-shop-sized jar of gherkins in less than 48 hours, I had high hopes when I found out that one of my favorite breweries were making a beery tribute to my favorite snack and they did not disappoint. Cool as a Gherkin, at 2.9% ABV, is a beer I could happily drink all day and beyond but I’d be just as happy with a bourbon chaser on the side. Tangy, sour, dill gherkin deliciousness – what a way to end an amazing weekend.